Creating your very own Elastic & Secure Cloud Servers. Elastic Cloud Servers gives you the features so you can take control of your very own Cloud. With our Elastic Cloud, you can provision any amount of server resources and provision any amount of virtual servers across our network in State-of-the-Art data centres. Utilising only Enterprise Disk Storage with our Elastic Cloud instances, we've guaranteed to deliver the highest performance for each Cloud Server. 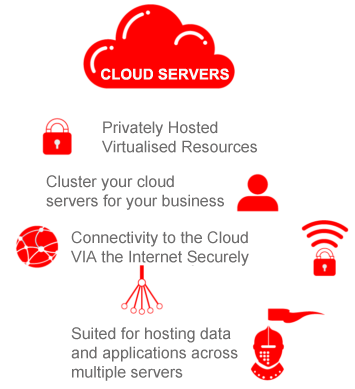 The Elastic Cloud is designed to let you purchase a bulk amount of Cloud resources (disk space, memory, bandwidth and IP addresses) which can than be used across our cluster of host of Cloud Servers so you can provision your very own Cloud Servers at anytime from our easy to use web portal. As part of our Elastic Cloud, you can spin up a virtual machine through our Cloud Portal for production or development/testing purposes and at anytime later on, be able to remove that virtual machine. * Estimated Price is based on the selected resources with 1 IPv4 address. Additional IPv4 IP addresses is $5.00/each per month. * All prices are in AUD (Australian Dollar) and include GST. Across our network, we use only DELL Server infrastructure that delivers us reliable and high performing hardware. Each of our DELL Servers connects to both power feeds for power redundancy while each of our servers include hardware RAID, using RAID 10 for data storage redundancy and performance. Upgrading or downgrading your Elastic Servers resources is simple and only takes just a few minutes. Through our Cloud Portal, you can change your servers resources and when your changes have been selected, this will be automatically applied to your Elastic Server for you with no downtime during these changes. Pricing for resource upgrades is based on a pro-rata fee for the anniversary date of the service. Credit will be automatically applied to the billing account in Cloud Portal when downgrading any server resources. When adding on our Semi-Management you are also adding on the daily R1Soft local backup and weekly R1Soft remote backup services, giving you peace of mind knowing that your data is backed up multiple times each week. Daily backups are automated each night and retains up to 7 retention points. Weekly backups are automated each Friday night and retains up to 5 retention points.